We're always watching out for new, fun, interesting and beautiful frames for our customers. 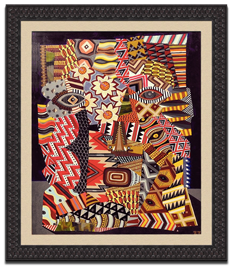 Below is a selection of "Primative," frames with textures and patterns that echo "tribal" motives. These frames are perfect for collections of indigenous paintings, fabric work and photographs. See framing ideas below and scroll down further for the "Primitive" samples. Top far left: A photograph of "Mud Cloth" paintings drying in the sun. 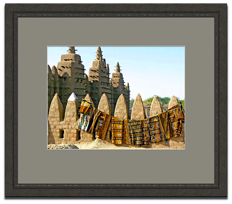 The photograhp is matted with a Java Bean (Weave) frame. See sample below. Bottom far left: A contemporary abstract painting on canvas by Zio Ziegler framed with a linen liner and a "Chocolate Gum Drops" frame. See sample below. Left: A mud painting floated in a "Primitive Black (Tall)" frame. See sample below.